Extracted from the blog of His Eminence Tsem Tulku Rinpoche. 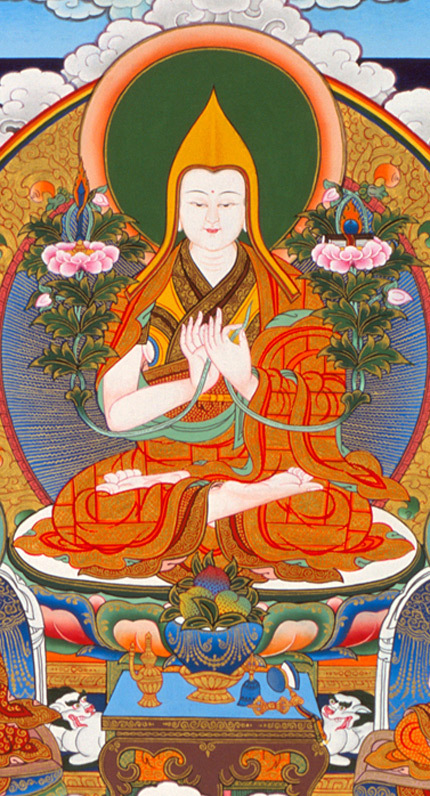 The iconography of Lama Tsongkhapa’s image is very important. As each symbolism is a representation of the entire stages of the path to Enlightenment. This is especially critical when inviting a Lama Tsongkhapa statue or thangka image to bless your house. It is more important when we need it for us to visualize during prayers and meditation. A statue with the correct iconography will help us in our practice very much. Therefore, it is highly recommended to bear the following in mind. Lama Tsongkhapa appears as a youthful 16 year old boy sitting in the vajra position on a lion-throne, lotus and moon cushion supported by eight lions. His skin is white with a tinge of red. Lama Tsongkhapa has one face, which is smiling with a happy state of mind. He wears a yellow pandit’s hat that has a pointed tip with two flaps, along with the three robes of a monk. Lama Tsongkhapa has two hands, they are either in the Dharmacakra Mudra form or the Long Life posture. The Dharmacakra Mudra form symbolizes turning the wheel of Dharma or teaching the Dharma. In his left hand, he holds the stem of a lotus between his thumb and index finger, the height of the lotus is at the same level of Lama Tsongkhapa’s ears. Atop this lotus rests the scripture of the Perfection of Wisdom in 8,000 lines with a wish fulfilling jewel above it. In his right hand, holding another lotus stem within his thumb and index finger, and the actual lotus also at the same level as Lama Tsongkhapa’s ears and is adorned with a flaming Wisdom Sword of Manjushri. In the Long Life form, the right hand of Lama Tsongkhapa is resting on his right knee and he holds a vase with his right hand. The vase symbolizes Lama Tsongkhapa dispensing the nectar of immortality to cure inner and outer sickness and restore health in our bodies so that we may be able to practice the Dharma. 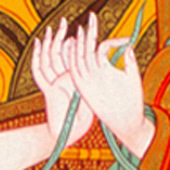 The Long Life Mudra Form. Lions – protection against the four fears (demons):the demon of the delusions, the demon of contaminated aggregates, the demon of uncontrolled death, and the Devaputra demons. Making a Lama Tsongkhapa iconography is very powerful. You can call him Lama Tsongkhapa, Tsongkhapa or Je Rinpoche. Lama means one without fault. Nothing evil, or negative in them, so therefore you call Him Lama Tsongkhapa. Tsong is onion; the place that Lama Tsongkhapa was born in Amdo was a place filled with a lot of onions. They grew a lot of onions, so they call Him the Man of the land of the Onions and He is a Buddhist Monk. He is very gentle, He is very very soft, and an emanation of Manjushri. And during His life, He did twelve great deeds, just like the Buddha. But out of all the deeds that He has done, the one that stood out most is, His incredible dharma teachings and the Lamrim’s works that he has made. He has written so much in the corpus of Dharma and Buddhism. He is the greatest Scholar from then till now. He has many Masters in Tibet but many of them didn’t write. Many wrote short sadhanas and prayers. But actual philosophical words of debates, and thinking and changing the mind and transformation on Tantra, on Sutra, Lama Tsongkhapa was unexcelled for writing them. And His writings today, are being used by all the Monasteries, the Tantric monasteries, and are used by monks and lay people. Even His sadhanas and prayers are still being used. His meditation for different deities and practices are still being used. Even some of the tunes that He developed for chanting to the Buddhas are still being used. And on top of that His clothes, the way a monk should dress has been adopted by all four sects of Buddhism. Because before Lama Tsongkhapa, monks didn’t have a set way of dressing. 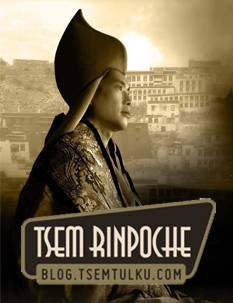 Even His hat, etc, everything was developed by Lama Tsongkhapa. So He is not a normal person. He is definitely a holy Enlightened Being. Therefore, Lama Tsongkhapa is very important. You have to be very careful in drawing His iconography. He always sits in the meditation posture. What does the meditation posture represent? It represents that He has become enlightened. But He has become enlightened by study, understanding, doing retreat and meditation. So he became a Buddha by meditation. So it symbolizes the importance of meditation for him during his life and us if we want to achieve higher goals. So it doesn’t really mean that we need to sit like this doing meditation. What it means is when we see Lama Tsongkhapa’s body, it reminds us that we must do practice. We must do meditation. That is a total reminder when we look at him. When we see His legs crossed like that, you must meditate, you must do your sadhanas, you must practice. You must put effort into your spiritual development, you must. And then you can reach the enlightened state. That is what is represented by His legs crossing. Then His hands are in a dharmacakra mudra. That‘s an international spelling of CAKRA. Some people put a ‘C-H’, but that’s not accepted, it’s more ‘C-A-K-R-A’, Dharmacakra. Dharmacakra literally means the wheel of dharma or turning the wheel of dharma. Why? If you look at Lama Tsongkhapa’s hand, this hand is in front of the heart, (Rinpoche using His right hand) expounding the dharma. Alright, the fingers are not together, when you draw, when you make statues, it’s not stiff, it’s soft (Rinpoche showing the correct hand gesture) teaching the dharma. And it’s where? Not touching the heart but in front of the heart, right. Very important, not touching the heart, but right in front, and this point where we actually touch the fingernail and the thumb is in front of the heart. So you can make the statues or your thangkas nicer, very delicately and very beautifully. Then His other hand beautifully drapes right in front. This hand not like that, that is impossible for a human body, it’s slightly down like this. But in artwork, you make it up a little bit because it is more beautiful. Alright, so in artwork, in statues you won’t make it like that, you make it like that (Rinpoche showing the correct hand gesture). So, what is it? This is the mudra. Mudra means hand gesture. This mudra in front of Lama Tsongkhapa represents what? His greatest activity on this earth, just like Lord Buddha, was teaching the dharma. 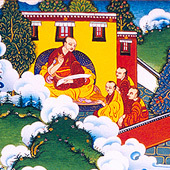 He taught and taught and taught by speech, also by writing books, and Lama Tsongkhapa himself had many scribes. It was impossible for him to write everything. He had efficient, quick, fast, hardworking scribes who actually wrote down everything he said and went back and see if it’s accurate. So that’s how His books got printed. So it’s very very important for Lamas to have writers and to have people who can write, who will do it accurately, who will put their energy into it and will complete it. And also Lama Tsongkhapa didn’t run around looking for printers and sponsors. His students took over that, His students went to talk to people, please sponsor this teaching, it will be very beneficial and they found the sponsors where they got the paper and they printed it out. They went to the printers, they got it sent, they got it done and in Tibet, printers are very complicated because unlike now, it’s all computer and all that. They take wood blocks, they have to take certain types of wood, straighten it out, make it very smooth, turn it around and commission a person to carve each word. So, if the text has 300 pages, that’s 300 wood blocks. And if one word was wrong in a wood block, they have to change the whole thing. So do you think Lama Tsongkhapa hung out at the wood block place waiting for his text to be printed? No. He didn’t do all that, He just gave His teachings. That’s why he was able to get a lot out because he had efficient people around Him, He did. So He was able to do what he can do, teach. 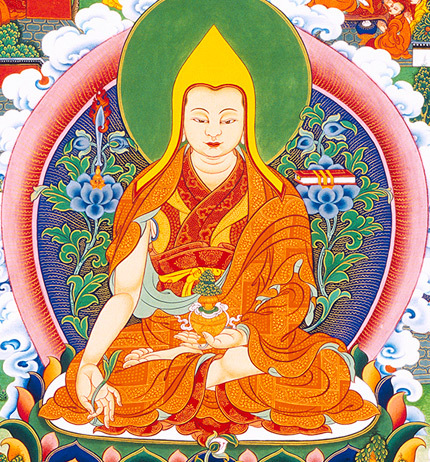 So His teachings are still alive today, by those voluminous works, and along with that, what’s written later by many great masters are based on Lama Tsongkhapa’s written works and teachings. And on top of that the greatest figures in our country, eg His Holiness the Dalai Lama, the Panchen Lama, all these great Lamas, their first incarnations were all students of Lama Tsongkhapa Himself. All. So His Holiness is the 14th right now. when He dies, 15th, dies 16th, previous life 13th , previous life 12th. 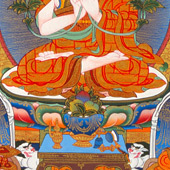 The first Dalai Lama was the direct disciple of Lama Tsongkhapa himself. And like that, in Tibet, you have many many great Dharma teachers who have many incarnations and their incarnations are direct students of Lama Tsongkhapa himself. Direct, coming back again and again. Incredible. The greatest work of a Lama is not to do rituals. The greatest work of a Lama, the best activity of a Lama is not to perform miracles or to do death ceremonies or weddings or you know, travel, or wear nice clothes, or build temples. The best activity of a Lama or Rinpoche, a teacher, is teaching. That’s the best activity, the only activity. Why? They are here specifically to teach, to expound and to give you the dharma. Certain teachers are quite realized. Certain teachers have many lifetimes of learning and experience. So when they teach it doesn’t come from one life. It comes from many lifetimes that they experience. That’s why the teachings are profound and deep although subject simple, they teach in such a profound way. Why? It’s not something that they practice for one or two years. Anybody in this life who takes good photography, good writing, it didn’t come from one or two years, it came from years of experience, the hardship and difficulties. Similarly something simple like that takes years of hardship and difficulties. Of course teaching the dharma that will transform other people’s mind, and their life and their future and their destiny is extremely profound. So, many Lamas in Tibet are quite realized. Realized in what sense? Their knowledge comes from many many lifetimes of thought, contemplation, meditation. So when they speak it actually comes from a very distinct past and it has an effect on us. Why? It is something that they have perfected. Therefore in Tibetan tradition, the best purpose of a Lama is to teach. If your Lama can teach and you create the facility for your Lama to teach and you create everything easy for your Lama to teach and there is no burden for your Lama in any way, just to teach and you will allow your Lama to do what he is supposed to do and you will receive the benefits of teachings, practice and results. If the Lama has to do everything but teach or cannot teach because he has to do everything, then you do not use your Lama in a correct way. So therefore, Lama Tsongkhapa shows that. Why? Teachers’ purposes, Gurus’ purposes is to teach. How is it most important? It is only by teaching and expounding the dharma, can we gain knowledge and realization. Without realization and knowledge there is no dharma. You can build temples, you can build statues, you can do pujas, you can put light, incense and flowers, and you can put pupe, dupe, aloke, gyande, newidye, food and all that, on a tray and you go like that (Rinpoche demonstrating how we do our offerings) in front of the Buddhas and you ring the bell, nothing happens. Why? Anybody can do that. You can teach a monkey to do that. Tibetans do that. Even a monkey can come with a tray, go like that in front of the Buddha and then rings a bell, nothing happens. What is dharma? What is puja? Puja means clear problems, clear obstacles by listening to the dharma and practicing the dharma. So the most important part of a Lama is to teach, most important. When a Lama cannot teach and you interrupt him with all kinds of stupid silly things and excuses and not doing work and breaking promises and not fulfilling them, if the Lamas is overwhelmed by that, and they cannot teach, his energy is drained, your purpose is not fulfilled, his incarnation is wasted. We say in Tibetan chud, is wasted. Some Lamas actually die early, they are gone, because they cannot do what they’re here to do. Many cases like that. Many many cases. One of my Gurus, Drikung Rinpoche, the same thing happened. He told, his previous life just died off. For several years, he remained completely silent. He was so unhappy with his students and having to repeat things and all the time disappointing him. He remain completely silent for seven years, he never talked. And at the end of seven years of silence, he went into meditation and passed away. He told me himself. So what happens is when you don’t let your Lama teach, and you make him do everything else, you waste him and you waste yourself and you waste the opportunities. While everybody has something good they can do, if we don’t do what we can do or learn to do something good, then how? Time, everything is wasted. That’s why in a family unit, everybody in the family has a job to make things work in the household. So when you do that in the household it works. If you lay it on one person, that one person could be a bread winner, cannot go and win the bread. Very very simple. So the function of a Lama, the highest function, the only function, and the real function, the real job of a Lama is to turn the wheel of the dharma and that is so important that’s why Lama Tsongkhapa shows his hand gesture. Out of all the gestures a Buddha can have, he shows his hand gesture like this meaning the highest job is teaching the dharma. And only by dharma can I bring you happiness, only by dharma can I change your life. Only by dharma can I bring you benefit. Only by dharma. So that is the highest and most important, therefore his hands are in this gesture, Dharmacakra. 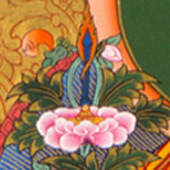 Then in Lama Tsongkhapa’s right hand, he holds a stem. The stem is a green sprout and clear, not thick like a rope, thin and clear. It has to balance up the body and opens up on the right into a beautiful lotus flower. The lotus flower opens up and is pink and it has a lotus bed on moon disc. On top of that is a sword. Why is there a sword? There’s a sword because the sword cuts. Cuts what? Cuts objects, trees, people, things, wood, paper, it cuts. So why does Lama Tsongkhapa holds a sword on a lotus on his right side? Because by listening and learning the dharma, it cut through our suffering. We can cut through our unhappiness. We can cut through our mind. We can cut through our difficulties and problems. And why is the sword on a lotus? The sword is on a lotus because a lotus represents compassion, love. Love and compassion, motivates this sword meaning this sword cannot harm you. It cannot damage you but it can cut away things that damage you. Why? Because it’s motivated by compassion. Then, on the left you have another stem on the lotus and on the top of the lotus is a dharma book. The dharma book is in a Tibetan form. 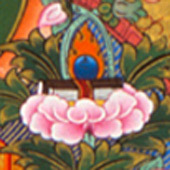 Tibetan dharma books looks like this (Rinpoche showing dharma book) and is sitting on a lotus on the left and on top of that it has jewels. It has beautiful jewels, you see there, there is a blue jewel. It has jewels on top of the dharma book. Why? A jewel in Buddhism doesn’t represent diamond or sapphire. We called it yid bzhin nor bu. ‘wish fulfilling jewel’. Why is it a ‘wish fulfilling jewel’? Because the dharma or the dharma book or the learning of the dharma, understanding of the dharma is symbolising you have a jewel. What does the jewel do for you? It removes your poverty, your problems, your difficulties. So when you learn the dharma it removes your poverty and difficulties like a ‘wish fulfilling jewel’. Therefore the best jewel in the world is not money, not things. The best jewel in the world is having knowledge. This knowledge does not come from a bad source, it comes from Buddha. So therefore, this jewel, this Buddha knowledge, the dharma is represented by the book. Why? We get knowledge from a book. And if we have dharma knowledge, it is the same as a jewel. Why? Jewels, a lady will take away poverty and difficulties from financial problems. Dharma jewel takes away something also. Therefore, when Lama Tsongkhapa has a book on a lotus here, (Rinpoche pointing to his left side) what does it represents? When you pray to Lama Tsongkhapa, when you meditate to Lama Tsongkhapa, when you make offerings or puja to Lama Tsongkhapa, if you do Lama Tsongkhapa’s mantra, what happens? Your knowledge will increase, your wisdom will increase, your memory will increase, your ability to speak will increase, your words will increase, the power of your speech will increase, conversation will increase, writing, science, learning, arts, drawing, music. Anything relating to music, art, writing, conversation, debate. Anything relating to learning and memory and comprehension, understanding can be achieved by praying diligently to Lama Tsongkhapa. So if you wish to learn, you wish to have a very sharp mind, if you want to the mind to be clear and aware and quick and fast, then you do puja and prayer to Lama Tsongkhapa as your main Buddha. If Lama Tsongkhapa is your main Buddha, many part of the mind will be converted. Much much better. So when Lama Tsongkhapa holds a dharma book, it represents what? It represents that you pray, you meditate, focus, chant and you make Him your Buddha and you do puja to him and you give yourself to Lama Tsongkhapa. Everything having to do with learning, understanding, clarity, awareness, quickness, sharpness, intelligence, debating, talking, art, music, science, will increase. Why? He is a Buddha of wisdom and knowledge, understanding, perfection of mind.